"With the power of soul, Anything is possible; With the power of you, Anything you wanna do." - Jimi Hendrix. I am listening to 'Jimi Hendrix' as I’m writing this. The hammering velocity and volume of ‘Alice In Chains’ greeted me on the other side, and I almost wept in frustration; fourty-five bucks wasted on this! I cursed myself. I dropped it there until my close friend and musical confidante, Kukil borrowed the tape from me – we were in the habit of tape-trading at that time – ah! good ol’ days…he told me that the tape was real cool and that he loved the howling guitars within. I gave the whole thing a re-listen, this time with serious intent because I really wanted to know what had made my buddy like it; and it’s been a long journey ever since. I remember how I headbanged when I had first heard ‘Holy Wars…Punishment Due’ by ‘Megadeth’. I also remember how I headbang now to ‘Am I Evil’ by ‘Diamond Head’ – that is where the beauty of rock and roll and metal lies - in giving you a reason to pump your fist and say ‘Hell yeah! F**k yeah!’ no matter who, what or where you are. I got introduced to most of the bands through tapes. That’s how I got into the habit of collecting original stuff. I started liking the originality of the real deal – the cover arts, the artist credits, the equipment, the producers and the lyrics. I became an early fan of ‘Iron Maiden’ and heavy metal, and then the rest followed. But I never really let go of my love for melody – I kept listening to ‘alternative’, ‘progressive’ and ‘blues’ based sounds along with ‘metal’, to keep me in touch with the roots. Analog sound was changing over to digital at the time when we were growing up – cassettes gave way to CDs and very rapidly to mp3 – but I stayed stuck in tape buying. I got into mp3 for a while in college but could not lose my love for tapes which continued till I moved to CDs. 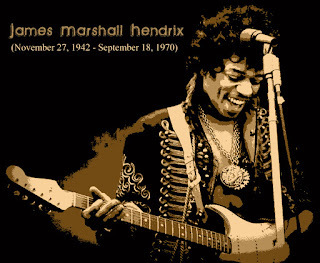 And yes, I still think Jimi did us a favor by playing his music. Nice read man. Write something on rockabilly. I like the sound of 50's. Blues with a country beat. Keep up Siddharth, like your posts.